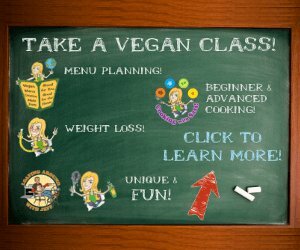 Looking for a vegan soup recipe? Why not make your own soup from scratch instead. Join me to learn how to make a creamy vegetable soup without a recipe. You know, it's really interesting when a dinner you're about to prepare seems like it's going to be a snoozer, but then miraculously it becomes your new favorite dish. That's exactly what happened last night when I was faced with 1 onion, 3 carrots, a medium yam, and a small sweet potato. This is SERIOUSLY the only fresh food I had left in my kitchen. So it's with utter amazement that this beautiful creation, which I'm calling Creamy Vegan Thanksgiving Soup, came into being. It's so delicious and pretty that you can feel comfortable serving it at your Vegan Thanksgiving dinner. 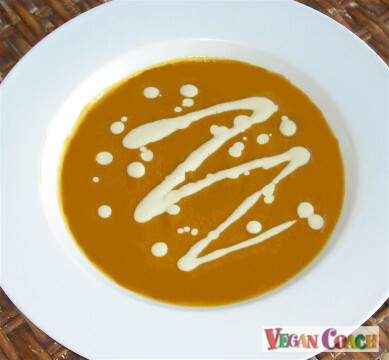 As I said, I had a nice little selection of autumn-colored foods (carrots, yam, sweet potato), and one of my absolute favorite ways of preparing these beautiful foods is to make a nice, warm and comforting soup. Creamy. With biscuits, if possible. Is that too much to ask? 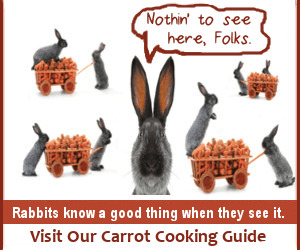 Now, as you may know by now I like to teach you the tools you need so you can create your very own recipes. So simply follow along to learn the steps I took to bring my veggies from their whole food raw state to a creamy dreamy soup which you can use to make your own vegan soup recipe. Because I'm working with sweet potatoes, I pull out the "Vegan Flavor Matches" for Sweet Potatoes, Potatoes and Yams. 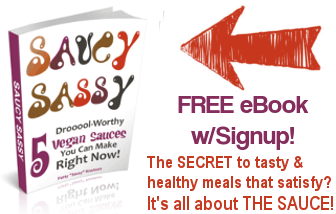 Flavor Matches help to take the guesswork out of recipe creation. You simply choose those favorite flavors from the list that you happen to have on hand. My soup adventure begins by coarsely chopping my onion. What do I mean by "coarsely chopping"? Quite simply, it means to cut imperfect and slightly larger pieces. Next, I slice my carrots, sweet potato and yam, making sure they're all reasonably the same thickness so they cook in approximately the same amount of time. I toss all the veggies into my soup pot with enough vegetable broth to cover -- for convenience, I just add water and then drop in a couple veggie bouillon cubes -- plop the lid on and set it to boiling. I also add some of the stronger spices so they have a chance to mellow out a bit. These spices were chosen directly from my Flavor Matches above: Cinnamon, cloves, cumin, nutmeg, paprika, salt and pepper. Feel free to add the flavors you prefer and have on hand. When the water starts boiling, I turn the heat down so the whole lot of it will simmer until the veggies are tender. Here's a photo of my tender veggies. It's starting to look like a soup now. 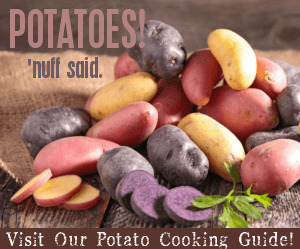 The wonderful thing about using sweet potatoes in your soup? They begin to break down into very soft hunks of sweet deliciousness which, when blended, turn your soup into a creamy, dreamy concoction. When my sweet potatoes are starting to break apart, and the carrots are tender, I'm ready for the next step. Blend the soup, in batches if necessary. I have my powerful VitaMix so I just pour the entire contents in and SLOWLY process the contents until completely smooth. Always be sure to let some of the steam escape while you do this or you'll have a huge mess on your hands (and literally on your hands too). So if you don't want to be a burn victim, please be careful when you blend hot foods. Pour soup back into the pot. Taste. What might you add next to make this soup perfect? I feel the spices are a little strong and need a little mellowing out, so I add some non-dairy milk and nutritional yeast. Further taste testing reveals it needs to be sweeter, so in goes some coconut nectar. Taste. A little saltiness is needed. I've already added sea salt, so for a change I reach for the miso. 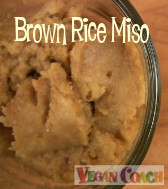 Miso is a wonderful way to add a salty flavor to your dishes because it's a fermented food, it's healthy, AND it's delicious. (A word about miso: Once you add it to your soup, don't let it come to a boil again or you'll destroy the fabulous nutrients inherent in the miso.) Taste. Just a little flavor perking up is in order, so I add a dash of lemon juice. Now, I taste one last time. It needs SOMETHING. But what? Let's think about the 4 Basic Flavors: Salty, Sweet, Bitter/Pungent and Sour. A-ha! I am missing a sour component! So, what can I add that's sour? How about some sour cream, one of the Vegan Flavor Matches listed above. Since I don't have any sour cream on hand, I whip up some Cashew Sour Cream. It literally takes one minute. Why make your own sour cream instead of using store-bought? Because YOU control the thickness. Keep it a bit on the thin side so it's pourable. Then you can spoon it over your soup to make a fun little garnish. Very hoity-toity, don't you think? 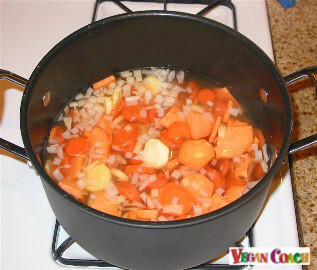 Add first 10 ingredients to a large soup pot and add enough vegetable broth to cover. Cover with a lid and bring to a boil. 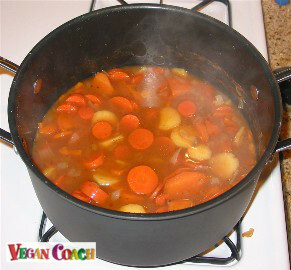 Then turn heat down and simmer until veggies are very tender (20-30 minutes). Pour ingredients into a blender and process slowly until very smooth. Be sure to let the hot steam escape while blending. Pour mixture back into soup pot. 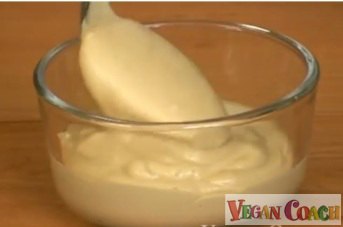 Pour into bowls, and spoon a little Cashew Sour Cream over the top. Serve with you favorite vegan biscuits. 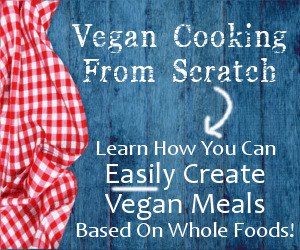 Hope this gives you a place to start in making your very own vegan soup recipe creations. Be sure to ask any questions or share comments below. "I made my first completely improvisational meal using your techniques last night and it was a hit! 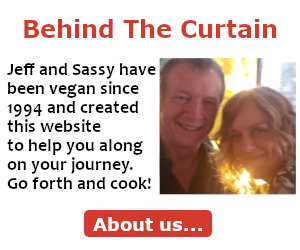 My husband swears your website has saved our diets. Thanks!"